We have to different oil press production line , one is hot press , the other is cold press. Customer can accord to his requirements to decide what press method he wants. The daily capacity of our oil press production line is 10-2000MT per 24 hours, it can process various kinds of oil seeds, such as sesame, soybean, sunflower seeds, peanut, coconut, rapeseeds, Cotton seed and so on. The oil residue is less than 6%. General speaking, if the final user plans to process several kinds oil seeds, please let us know, then we can collocate special oil press proudction line. 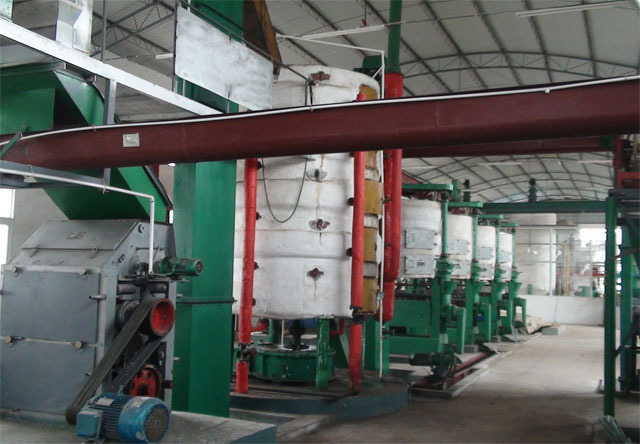 2.Oil press production line includes two parts: oil seeds pretreatment part and press part. A.Pretreatment Equipments is used for pretreating the raw material, it includes: shelling equipment, Separating equipment, Sieving equipments, Crusher, Flaking machine, Cooker. Different oil seeds, pretreatment machines are a little different. B.Pressing part includes oil press machine, Clarifying tank. Oil press machine is the most important mahcine in the whole oil press production line. Different oil press , the oil residue is different.